On Saturday and Sunday, August 31 and September 1 — Labor Day weekend — 30,000 heat seekers will converge on tiny Hatch, New Mexico, for the 42nd annual Hatch Chile Festival. The town of Hatch, population 1680, is the self-proclaimed “Chile Capital of the World” — and who are we to argue? Customers then lug the roasted chiles to their cars in net or burlap bags for what I can only imagine is an eye-stinging, nose-watering trip home. One of the most evangelistic promoters of the Hatch chile phenomenon is our friend Robert Schueller, Director of Public Relations for specialty produce distributor Melissa’s/World Variety Produce, Inc. 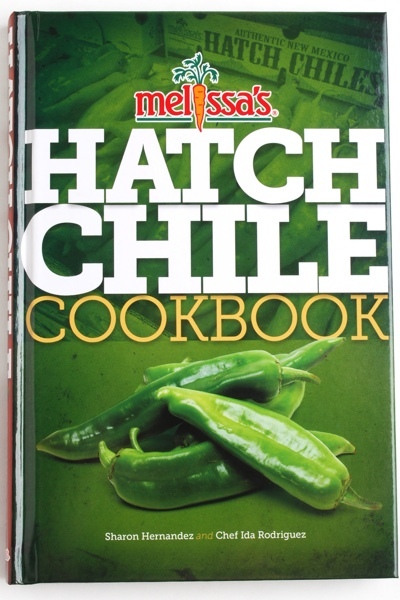 The company just published a new book, Melissa’s Hatch Chile Cookbook, by Melissa’s co-founder, Sharon Hernandez, featuring more than 150 tongue-blistering recipes. To promote it, Melissa’s is dispatching authentic chile roasters to select grocery stores across the country during Hatch chile season. Perfect if you can’t make it to New Mexico this year for the festivities. Melissa’s online store sells both fresh and dried Hatch chiles as well as an amazing pure Hatch chile powder. Also, here is the chile roasting schedule on Melissa’s website. You may be surprised to learn that chiles are not — despite their widespread local use — native to the American Southwest. Botanists believe chiles originated in South America, and were spread to the Caribbean by birds. Mariners like Christopher Columbus helped chile peppers circumnavigate the globe. Years of research at the University of New Mexico by one Dr. Fabian Garcia during the early years of the 20th century led to the development of a blight-resistant strain that thrived in the fertile Hatch Valley. Sunny days — and New Mexico has 350 of them a year, on average—tempered by cool nights turned out to be the secret behind one of the world’s most electrifying chiles. Today, the smooth, thick-walled Hatch chile is prized by culinary hotheads for its earthy-herbaceous flavor, versatility, and consistent, decisive heat. Note: Hatch chiles range from mild to hot (but rarely unbearably incendiary) depending on the seed variety grown, and are usually labeled for the consumer as such. The whole chile holds up well to stuffing and baking. When roasted and peeled, the flesh is lush and aromatic. The Hatch can also be frozen for up to a year without sacrificing flavor or structural integrity, which is certainly not true for most chiles. Now, about that gadget I mentioned earlier. At Barbecue University™ this past June, our students test-drove an ingenious chile roaster for home use called the “Roast ’Em Up®.” Looking for a way to efficiently roast 25 pounds of Hatch chiles he’d ordered, Arizona native Patrick Driscoll built a prototype chile roaster that fits a standard motorized rotisserie spit. We roasted about 10 pounds of mixed chiles in the locking octagonal-shaped roaster in less than 30 minutes on a gas grill. Patrick now sells his roasters online at www.roastemup.com. 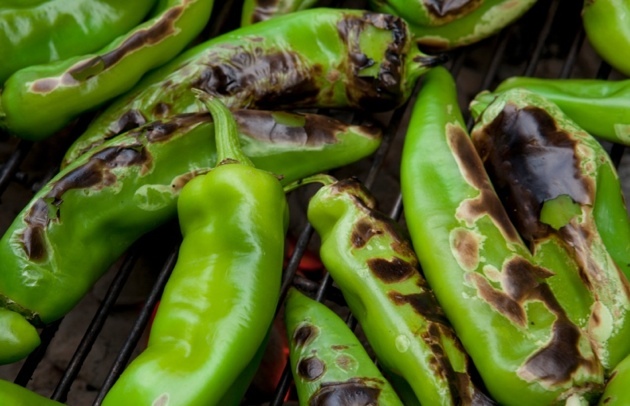 Below are several options for roasting your New Mexican chiles at home. Please note: High heat is essential for roasting chiles. You want to quickly blister the skin, even blackening it in spots, but you don’t want to cook the chile flesh itself. Preheat your charcoal or gas grill to high, arrange the chiles on the grill grate, and char, turning with long-handled tongs, 6 to 8 minutes in all. Though less efficient, you can roast the chiles one at a time by holding them over an open flame on a gas stove with long-handled tongs until blistered and blackened in spots. Or rest them directly on the burner ring and turn as needed. Arrange on a flame-proof surface and use a blowtorch to quickly char the skin, turning as needed. 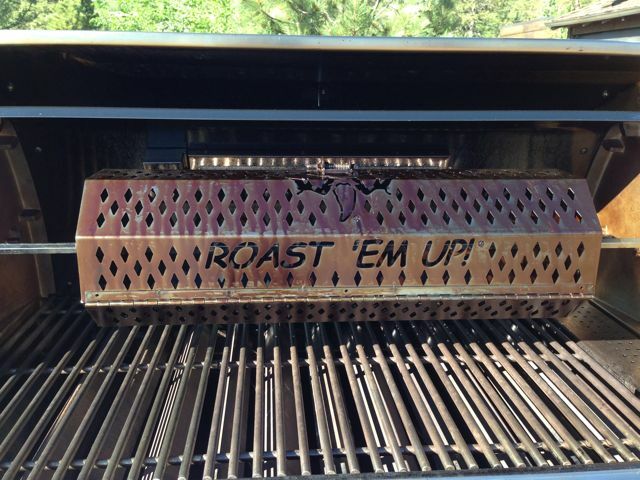 Attach an enclosed rotisserie grill basket to your motorized rotisserie spit; tumble the chile peppers over high heat until blistered. Let the chiles cool completely after roasting. If using immediately, peel the blistered, blackened skin off with your fingers or a paring knife. (Plastic gloves are recommended if you are working with more than a few chiles as their volatile oils can irritate your skin. And never touch your eyes or other sensitive parts after handling chiles.) Cut off the stems, slice each pepper lengthwise, and remove the seeds and ribs. If stuffing, slit each pepper lengthwise and remove the seeds and ribs, but leave the shoulder and stem intact. For an alternative, check out Melissa’s Hatch chile powder in our store.